TechBridge’s Nonprofit Operations Consultant, Sean Williams, contributed this post. Understanding data and measuring impact is a critical skill. Understanding data is no longer an expectation reserved for tech nerds who work behind the scenes. Today every nonprofit must be able to measure and track outcomes in order to articulate its effectiveness. In fact, some, like panelist Dr. Bennie Harris of Morehouse School of Medicine, posit that being able to understand data and measure impact is now a skill equally as essential to a development officer’s profile as is the traditional soft skills the position has been known to require. In the past, a mentoring organization could get by reporting on how often mentors and mentees participated in an activity together. Today funders may ask an organization to show the number of mentees who went on to graduate from high school, attend college, and secure a job with sustainable income. Good data, accompanied by critical thinking, can also lead to surprising insights that allow nonprofits to serve our clients and our community in innovative ways. Panelist Jim Reese, Atlanta Mission president and CEO, shared an interesting fact he discovered when reporting from his newly implemented Client Management System: 8,500 unique individuals stayed at an Atlanta Mission shelter in Atlanta, a number higher than the total number of individuals in shelters in Atlanta (per DCA’s annual Homeless Count). This discrepancy pointed to a high level of transience in Atlanta’s homeless community that Reece hadn’t been aware of. 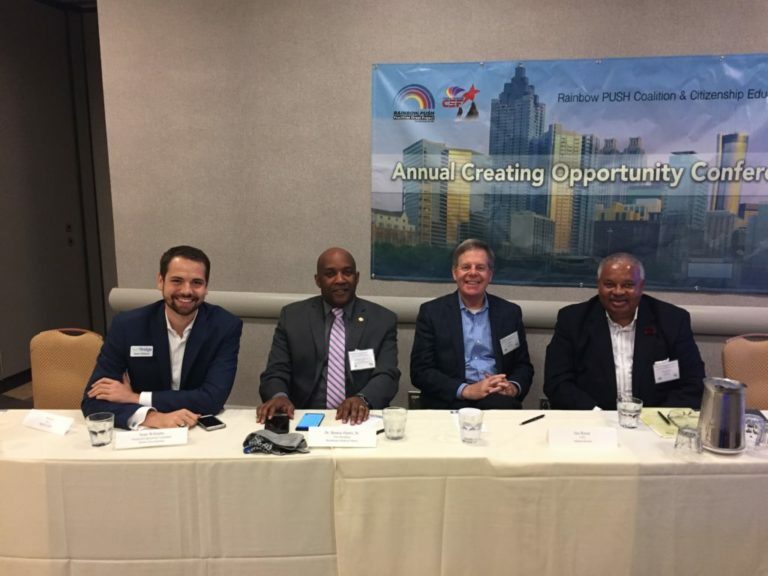 As a result of this discovery, Reese has challenged his team to think critically about how to better serve individuals who may be new to Atlanta or passing through the city and less familiar with the resources available. Fortunately for nonprofits, the kind of out-of-the-box thinking that can help us serve our clients more effectively can also generate new streams of revenue. For a great example of out-of-the-box thinking, look at Atlanta-based Good Measure Meals, a calorie and portion-controlled gourmet meal program that directs all net proceeds back to parent organization Open Hand, a nonprofit that combines home-delivered meals and nutrition education to empower people to live healthier, more productive lives. Good Measure Meals’ innovative business model has helped differentiate the brand from other meal plan services while bringing revenue to help Open Hand increase the breadth of services it is able to offer to the community. It’s crystal clear that data has undeniable value to nonprofits. Nonprofits must begin to think creatively, not just about how their data can help them demonstrate their impact, but also about how data can open the door to new insights regarding the communities they serve and inspire new revenue streams that will allow them to serve those communities even better. To find out how TechBridge can help you do more with your data, click here.